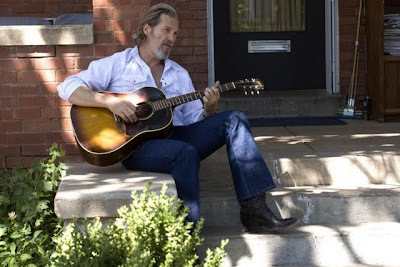 Since Crazy Heart is at its own heart an ensemble piece, it makes pitch-perfect sense that the man doing the arranging for the band of actors was none other than an actor himself in the form of debut writer/director Scott Cooper. 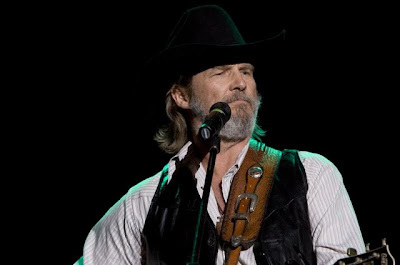 With a background that easily lent itself to the undertaking of “a performance-driven story,” Cooper adapted the critically acclaimed novel by Thomas Cobb for what would become 2009's ultimate character piece -- not to mention one perfectly suited to the established talent of Jeff Bridges, who took home an Oscar for the work in 2010. A hard-drinking, womanizing, living, breathing country western song in his own right dubbed Bad Blake for good measure, Bridges' lead is heartbreakingly charismatic and achingly beaten down from his outstanding promise as a songwriter by the next bottle of booze or the next willing floozy in his motel room. When he finds himself drawn in by a woman who doesn't say “yes,” but gradually finds herself pulled his direction by the improbability of romance at one in the morning in the form of Jean (Maggie Gyllenhaal), a beautiful aspiring journalist and single mother, Bad realizes for the first time in a long time that he'd rather be good than Bad. Set in dive bars, cruddy motels, and bowling alleys along the southwest, Jean's home is as shiny and filled of bright promise as the large stadium that Bad is invited to play at, opening for his protege who made his material number one – Colin Farrell's Tommy Sweet. Whereas Bad 's money goes right back to the bottle, Tommy has somehow managed to embrace fame and life with a positive approach while staying true to his roots as an old country music force in a world of synthetic pickup truck rock. 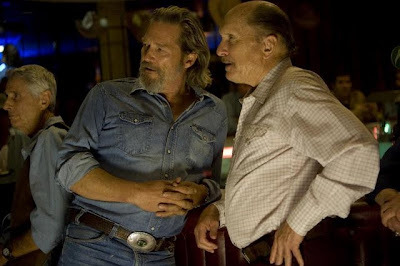 Additionally, the movie features a fine supporting turn by Robert Duvall who also served as one of the film's producers as a loyal friend of Bad's who understands his potential and how much he's thrown his life away – having played a down and out singer himself decades earlier in Tender Mercies. Cooper's Crazy Heart is a film filled with uniformly excellent performances where Bridges is the headliner and everyone else gets their chance to briefly shine when “introduced” as members of the band. And while of course, the always underrated Bridges fits his role perfectly, I couldn't help but wonder if it was a little too close to roles he'd already played like an amalgam of The Big Lebowski and Fabulous Baker Boys blended with the real Bridges. And it is this nagging doubt that still fails to make me a firm believer that the Oscar went to the right man since other leads were far more transformative including Michael Stuhlbarg in A Serious Man, Sam Rockwell in Moon, Jeremy Renner in The Hurt Locker and Matt Damon in The Informant!. Yet, this shouldn't detract from the masterful Bridges in the slightest since he just isn't given that compelling of a screenplay from Cooper as we've seen this style of film far too many times in the past from Maggie Gyllenhaal's own Sherrybaby to Half Nelson, Robert Duvall's The Apostle and Tender Mercies etc. With a few rushed plot points and too much repetition, Bridges embodies his character fully but is never given the chance to really show us that Bad Blake is anything more than someone he's played before... except, that is, whenever he's in the same company of Maggie Gyllenhaal who manages to break him out of the drunken stupor and really put the spotlight on the man rather than the drunk. In fact, it's Gyllenhaal once more who proves she's one of cinema's true MVPs in an Oscar nominated role that reveals subtle nuances on a second viewing that you might not initially catch. 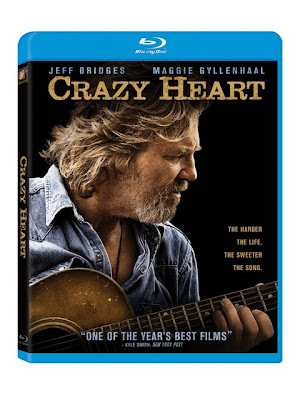 And this is especially the case since the first screening of Crazy Heart finds Bridges' command of character and word-of-mouth hype demanding your total attention as he stumbles, sings, swerves and pukes from one scene to the next. Although love puts him on the path to redemption as the press notes promise, the final act for Bad goes far too easily on our main character, giving into nostalgia as opposed to the realism of a relapse or withdrawal in a way that made me scour the deleted scenes for something slightly truer. And even if it's guilty of forced sentimentality in the wrap-up, the movie earns bonus points for avoiding cliché in terms of Bad's relationship with Jean that the two actors play beautifully in the midst of the southwestern landscape. An above average venture in a genre we know far too well -- while Crazy Heart isn't quite the film that Half Nelson was, I felt like it resonated more than Tender Mercies thanks to the grounded, ethereal turn by Gyllenhaal that deserved at least half of the amount of press given to the always impressive Bridges. Exquisitely transferred to Blu-ray to the point that in a side-by-side comparison, shadows came alive that were missed on the DVD screener and the sound made you feel like you were a member of the pick-up bands that Bad played with on the road, Fox delivers a great combo disc including a mini-interview with the leads, a plethora of deleted scenes and a digital copy for your portable device.